US Corrections is looking for outstanding ex law enforcement officers, corrections and military to add to our ranks. We are interested in officers who exhibit integrity, professionalism and dedication to bring their skills and experience to a challenging but rewarding role. 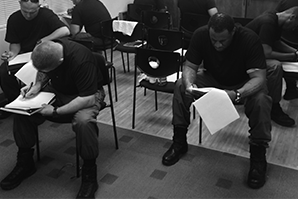 US Corrections is seeking a Training and Personnel Sergeant to manage a team of 40 Officers in and out of Orlando, FL field office. This position is supported by 2 Corporals. The candidate will show good organizational skills and proven leadership experience. US Corrections is seeking qualified officers to perform road duties in the prisoner extradition section. Application will need to pass in house testing, external drug testing, background checks, DMV checks and written testing to be eligable for the position. US Corrections is seeking qualified applicants for dispatching. Candidate will have at least 2 years experience in dispatching and radio communications. In house testing will be given to perspective applicants. Candidate must pass background checks.